Ocboter 6, 2012 – Intelligent driving that saves energy and increases safety always means anticipating what’s on the road ahead. An array of sensors is today already at work in vehicles to help drivers do just that. The anticipation “horizon” of these sensors is often limited, however, and confined to the vehicle’s immediate surroundings. ” ‘Car-to-X’ communication greatly extends the anticipation horizon and will in future allow drivers to look far into the distance, see things that are hidden, and even peer round several corners” explains Karl-Ernst Steinberg, Manager Projects IT Drive at BMW Group Research and Technology. Car-to-X communication means networking vehicles and infrastructure with one another electronically, enabling a direct exchange of information between both the vehicles themselves and between vehicles and the traffic infrastructure, such as traffic light systems. This makes Car-to-X a comprehensive messaging network that every road user can be involved in. The German federal state government of Hessen, the city of Frankfurt am Main and a number of prominent universities and research institutes have joined forces to work on the research project “simTD”. simTD is a German abbreviation for Safe Intelligent Mobility — Testing Ground Germany. The objective is to test out the functionality, everyday practicality and effectiveness of Car-to-X communication under realistic conditions for the first time. Car-to-X communication essentially takes place via wireless LAN and mobile network connections. It is based on high-speed WLAN, which is derived from the high-frequency WLAN standard IEEE 802.11p or ITS G5A and allows real-time communication. The protocol is structured in such a way that many different subscribers can communicate with one another in parallel with zero interference. At the same time, mobile communications networks are becoming more and more powerful too, with higher bandwidths and ever shorter delays in data transmission, or latency as it is known. As a result, they are playing an increasingly important role for Car-to-X communication, for instance as a way of supplementing the WLAN communication. 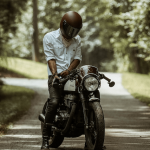 Besides applications for BMW Group cars and for protecting pedestrians and cyclists, integrating motorcycles into the system of reciprocal networking, too, is an especially important aspect of Car-to-X communication. 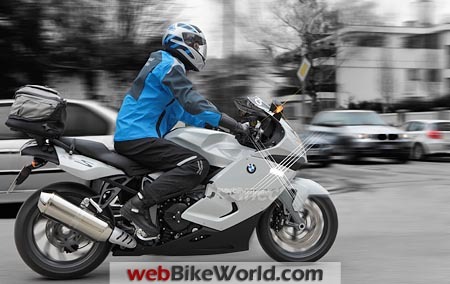 BMW Motorrad ConnectedRide is the two-wheeled equivalent of BMW ConnectedDrive and focuses on enhancing safety for motorcyclists. One of the project’s key elements centers on the development of rider assistance systems on the basis of Car-to-X communication. Motorcyclists have to contend with other dangers out on the road than motorists. Certain situations, such as fog, slippery roads or heavy rainfall, pose far more of a challenge for motorcyclists. Also other drivers unfortunately often fail to see motorcycles due to their slim outline. So, it can be of great benefit to motorcyclists if they receive advance notification of specific situations. It is often the cars which play a crucial role here, by acting as the warning triggers, as it were: switching on the fog lamps, activating the fastest windscreen wiper setting or intervention by the car’s DSC system during normal driving can all point to adverse conditions at a particular spot. 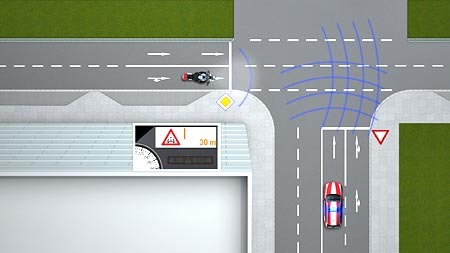 This information is relayed to the motorcycle to keep its rider fully informed of what’s ahead. Various driver and rider assistance systems based on Car-to-X communication are being tested for BMW Group cars and motorcycles as part of the simTD research project. By getting traffic light systems to transmit information on their phase times, for instance, a driver assistance system can either indicate the ideal speed for catching all the lights on green or warn drivers before they drive through on red (Traffic Light Phase Assistant). By transferring specific data about traffic levels, the state of the road surfaces, as well as other factors, it is possible for a vehicle to issue advance warnings of accidents (obstruction warning), traffic tailbacks (end of tailback warning) or black ice (road weather warning) to other road users in the vicinity. It is furthermore possible to calculate the risk of a collision on the basis of the transmitted vehicle data, meaning that drivers can be alerted to possible crashes at road junctions, for example (Intersection Assistant). Further Car-to-X functions featuring in the simTD research project include an emergency vehicle warning, electronic brake light, as well as the Traffic Sign Assistant. Besides the development of vehicle-specific applications, the government-backed simTD project also seeks to improve traffic management. To this end, the city of Frankfurt am Main and the German state of Hessen are working on intelligent systems for optimizing traffic flows on our roads. The necessary data is provided by the simTD test vehicles and can be used, for example, to cut congestion, lower CO2 emissions and reduce waiting times at traffic lights. Further information can be found by visiting the simTD website.